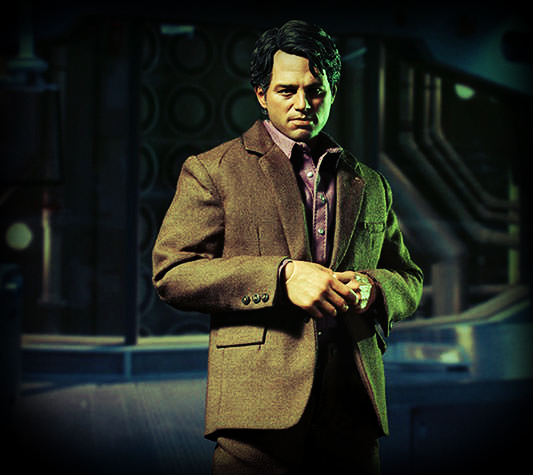 Robert Bruce Banner was born the son of a scientist who hated him and a mother who loved him. His father believed that his own work in nuclear research had affected young Bruce, whose vast intellect was proof enough to the man that his son had been mutated somehow. He snapped and became abusive to Bruce and killed his mother when she intervened, and was subsequently institutionalized. Bruce was scarred by these events and furthermore hated school, typically bullied and treated poorly by everyone. He did exceptionally well, however, and was later approached by the military to do nuclear research for them, which he accepted. While working on the development of a gamma bomb for the military, Bruce rushed to the rescue of a teenager who had, ignorant of the bomb's imminent testing, wandered onto what would be ground zero. He managed to push the teenager, Rick Jones, to safety in a ditch, but Bruce himself was irradiated with gamma energy and only miraculously survived. However, he soon became the brutish Hulk at sunset, returning to human form at sunrise. Later, this developed to him becoming the Hulk whenever his adrenaline levels, when stimulated by anger, rose. It tore Bruce's life apart due to the unpredictable nature of the Hulk, and for a while he was pursued by the army for with the Hulk had done. Eventually, he was able to treat himself with further radiation and gain a modicum of control over the Hulk when transformed, although he still could not fully command him and had great difficulty transforming back from the Hulk to Bruce. He later received a pardon after defeating the alien Metal Master, and some time after this, when freed from cosmic manipulation, joined the founding members of the Avengers to oppose evil. HULK: After being bombarded by gamma rays, Bruce has been able to transform into the super-powered behemoth known as the Hulk. The Hulk's strength increases proportionally to his anger, which gives him a potentially unlimited strength; however, this can act against him as, although he can propel himself at high speeds, his super-strength can also destroy surfaces and prevent him from maintaining purchase. He is furthermore able even to regenerate parts of his body, which is also highly resistant to most forms of damage and immune to most poisons, radiation, and disease. He is also able to withstand extreme pressure, as well as extreme temperatures, and changes in pressure, such as caused by sinking in the ocean, do not tend to affect him. SCIENCE: Bruce is one of the foremost geniuses on the planet, defying any attempt to measure his intellect in any sort of test. He is possibly the greatest living scientist in the field of nuclear physics. COMBAT: As the Hulk, Bruce is able to engage foes by using his tremendous power. He is not the most sophisticated at fighting, but with his immense strength, he doesn't need to be. ANGER MANAGEMENT: Through meditation and practice, Bruce is able to affect a minor and occasional influence on the Hulk even when Bruce is the recessive personality. He can precipitate transformation into the Hulk fairly easily, although forcing himself to transform from the Hulk to Bruce is much, much more difficult. AVENGERS: Bruce's membership as the Hulk in the Avengers affords him certain advantages, as well as contacts that can assist him in lifestyle both public and private. He also has, for his use, the vehicles, technology, and facilities of the team if he should need them. CONTACTS: Bruce has many useful contacts, mainly through the Avengers but also outside of the group, that he may call upon to assist him. Bruce's mind is a complicated one, and his early life proved an influence on the man he would grow up to be; his abusive father and unsatisfying school life affected him to the point that he may have had something of a multiple personality developing in his consciousness even before the advent of the Hulk, simply to cope with the trauma and stress. He is, generally speaking, a reasonable man with a reasonable temper, but once something really makes him truly angry, he is fearsome to behold. Due to his meditation and attempts to train himself to manage his anger, he tends to have a more easygoing appearance most all of the time. He is good at dealing with minor annoyances, because he's deeply aware of how they can set him off, if allowed to go unchecked. If all else fails, he is not above removing himself from a stressful situation so as to avoid disaster. His scientific genius is his greatest solace, and he happiest when he is able to focus the entirety of his intellect and attention in the realm of experimentation and research. Although he is very fond of people whom he may regard as friends, he often withdraws from everyone by what he feels is necessity. It makes him lonely though, and the Hulk's unpredictable nature means that Bruce, at times, becomes a complete hermit for what he feels is everyone's benefit, even his own. He is a sensitive man, a caring man, a feeling man, and every tragedy caused by the Hulk's anger is a weight on his mind. He does not forgive easily, most especially himself. Due to his own early life and unhappy childhood, he is also especially sensitive to the terrible results of violence, and it affects him every time he cannot prevent it. In many ways, being the Hulk can be fulfilling. But similarly, it can also be horrifying, being a prisoner in one's own body and unable to affect any significant course. Bruce's life can be a cycle of appalling torment that is the most fundamental kind of body horror. SOLITARY: Bruce tends to withdraw from people, even friends and loved ones, for their own safety and his own peace of mind. It can lead him to remove himself from social situations, for fear of anything happening to lead to tragedy, and as a result he doesn't tend to maintain much of a social life. Others tend to misunderstand his reasoning behind this. He also does not function very well in teams. WITHDRAWN: Emotionally, Bruce tries to keep himself free from too deep of emotional investment, due to the fact that extreme emotion may lead to a manifestation of the uncontrollable Hulk. As a result, he often will not allow himself to engage in things that stand a risk of producing strong emotion, and of course many of these things are regarded by others as the things that make life worth living. NONVIOLENT: Bruce, quite different than the Hulk, tends to avoid violence to the extreme. Even when his life may be in danger, he is reluctant to engage in violence to resolve a situation because giving himself over to it is likely to lead to a manifestation of the Hulk. HULK: The Hulk is difficult to control, and he is tremendously dangerous. His potentially unlimited power through anger is horrifying for those who understand it, and Bruce most of all. He knows what a danger the Hulk is. And the Hulk's extreme actions can easily cause tremendous devastation that later Bruce may have to answer for. Even his allies tend to regard Bruce with caution rather than trust, because they know that if he should lose control, even for a moment too long, he could become as much a threat, or more of one, than anyone they may fight against. CHILDLIKE: The Hulk is childlike, both in his temperament and his intellect. He possesses simple reasoning skills and fundamental verbal skills, but little more. Complex problems usually confuse and frustrate him, and he is vulnerable to even the most basic of traps. This can be used to some advantage, in comforting and calming him. UNLIMITED POWER: Theoretically, the Hulk has unlimited power related to his anger levels, but in fact this can work against him as well, since his strength increasing can cause him to become clumsier since things are unable to stand his might; he is unable to move very quickly when his strength passes a certain point, because his feet will destroy the surface and render it impossible to move, for example. He is also, despite a tremendous system, unable to maintain his anger levels indefinitely and is guaranteed to calm down with the passage of time.